It happened because the climate science (and environmental) community is entirely too comfortable with REALITY rather than perception. The scientist above cites the reality of the story. But Bill, like virtually everyone else who was exposed to the massive right wing media barrage of last winter, was unable to make it past the perception of dishonesty. Type One is using public relations to deceive the public. This is the stuff that scientists, handicapped by their blind obsession with the truth, rightfully live in fear of. But Type Two is using powerful communication tools to blast the truth out to the public in a voice that can override disinformation campaigns. Climategate saw the right wing media do A LOT of the Type One style of communication. But sadly, it saw none of the Type Two style from the science community. There was a desire among many top climate scientists to engage in Type Two, as evidenced by their sad little letter in Science Magazine. But that just doesn’t cut it. We’re talking hardball here. And until the science and environmental communities realize this and begin to allocate the serious resources needed, the truth will continue to fall victim to the communication dynamics of today’s massively polarized media environment. This shouldn’t happen. 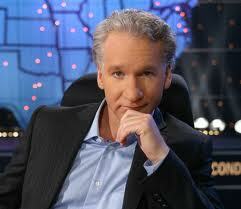 Good guys like Bill Maher shouldn’t be making such mistakes. It’s not his fault. It’s the fault of the communicators.